Tanzania, population over 50 million, is a presidential constitutional republic with its capital city Dodoma. Dar es Salaam is the country's largest city. During the late 19th century Germany formed German East Africa which became British after World War I. The mainland was Tanganyika, separate from the Zanzibar Archipelago. 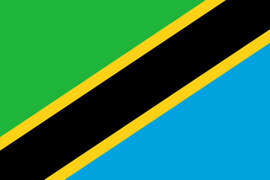 After both became independent, in April 1964 they became the United Republic of Tanzania. Flag and maps from Wikipedia. DR Congo, Zambia, Malawi, Mozambique, Indian Ocean. DAR ES SALAAM, April 23 (Reuters) - Tanzania on Tuesday denied blocking the publication of a critical International Monetary Fund report that accuses President John Magufuli's government of undermining economic growth with "unpredictable and interventionist" policies. DAR ES SALAAM, April 23 (Reuters) - A landslide triggered by rains killed at least three people at a mine in the northern Tanzanian town of Arusha on Tuesday and left several people injured, a senior police official said. DAR ES SALAAM, April 23 (Reuters) - Tanzania aims to have six times its current power generation capacity by 2025 through investment in thermal and renewable energy, deputy energy minister Subira Mgalu told parliament on Tuesday. NAIROBI, April 18 (Reuters) - Tanzania's economy will be subdued if recent government policies and legislation continue, threatening to hit growth in East Africa's third largest economy, an International Monetary Fund report seen by Reuters on Thursday said. NAIROBI, April 17 (Reuters) - NIC Group's shareholders have approved its merger with the Commercial Bank of Africa, the company said on Wednesday, paving the way for the two companies to combine their operations. NAIROBI, April 17 (Reuters) - Pretax profit at Kenya's Nation Media Group fell 16.4 percent to 1.6 billion Kenyan shillings ($15.83 million) in 2018, the company tweeted on Wednesday. NAIROBI, April 17 (Reuters) - Kenya's Nation Media Group said on Wednesday its pretax profit fell 16.4 percent to 1.6 billion Kenyan shillings ($15.83 million) in 2018, according to a tweet by the Daily Nation.